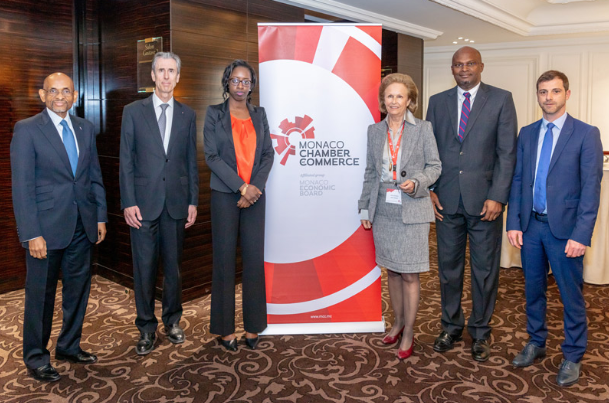 During the 2nd Bilateral Commission Meeting between the Republic of Mali and Monaco, the Monaco Economic Board (MEB) organised a business meeting with CEMA (Club des Entrepreneurs Monégasques en Afrique) on Friday 15 March at the Hôtel Hermitage. A chance to build on already established ties. The meeting was attended by Minister of Foreign Affairs and Cooperation, Gilles Tonelli, and Mrs Kamissa Camara, Mali’s Minister of Foreign Affairs and International Cooperation. There were business presentations and an interactive session, during which the 44 people present (institutions and private sector) discussed investment and business opportunities in Mali which, despite a difficult environment, posted GDP growth of 5.3% in 2017. For some members of the MEB and CEMA (Aurum, ASCOMA, Montecarlofruit sarl) already operating in Mali it was an ideal opportunity to strengthen their links and networks with a Malian delegation of dynamic young enterprises. There was much discussion by everyone keen to learn more about investment opportunities in Mali and potential business synergies, notably in agriculture, energy, infrastructure, minerals and refining.